Several of my favorite plants have been found in the unlikeliest places. I discovered this beautiful hibiscus for sale in a local deli. It wasn’t blooming when I bought it; I assumed it would have the appearance of a typical garden shop hibiscus. What a surprise awaited me when the multi-hued double petals opened for the first time. In the Autumn, I will bring the plant indoors and try to keep it alive and blooming for years. At some point I know I will have to capture this flower in watercolor. 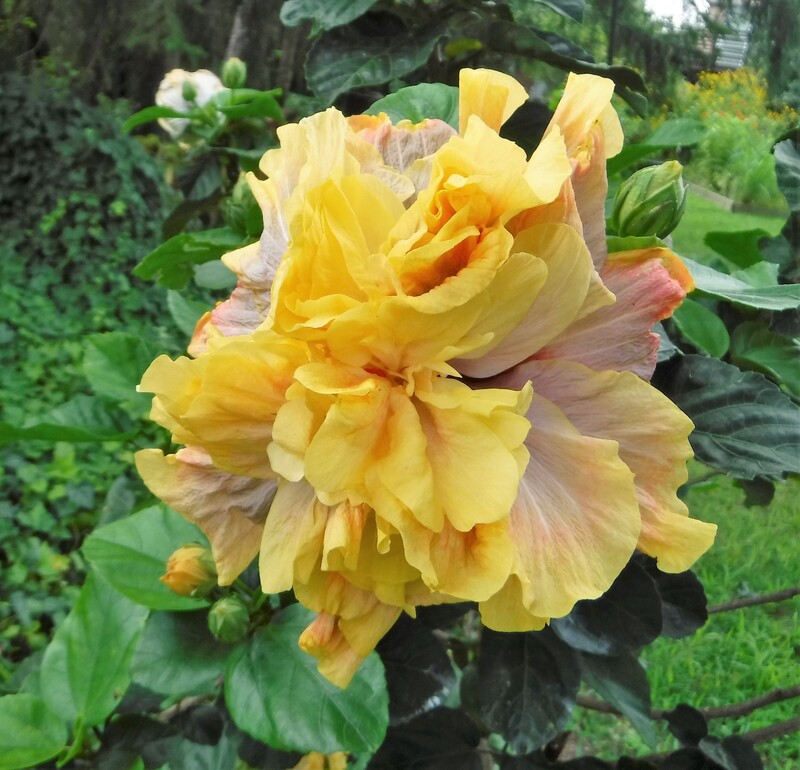 This beautiful bloom is part of Cee’s Flower of the Day. Photo Challenge – Weather Vane Wednesday/Choo Choo! Thanks so much! I’ve enjoyed watching the big buds open. Although…I’ve had squirrels or other animals who seem to like climbing the tree and eating the buds. They must be tasty to garden animals. The flower is gorgeous, and I’m sure you will be successful at keeping the plant alive and happy. The flower is a beauty! I hope you are able to sustain it over the winter. We are choosing which of our hanging baskets will go with us to spend the winter in Florida. That is ONE BEAUTIFUL flower will be anxious to see it in person.